"Amelias Gate" is a permanent sculptural memorial to Amelia Earhart that also serves as a gateway to the city of Atchison, Kansas. First illuminated on the 100th anniversary of her birth, the work uses the physical qualities of light to create a bold, thoughtful mark on the landscape of the Aviators youth. The work draws its form from the dynamic elegance of the individual it memorializes while paying homage to those rare qualities that still inspire us all. The sculpture uses the recently renamed Amelia Earhart Memorial Bridge as its physical and metaphoric armature. 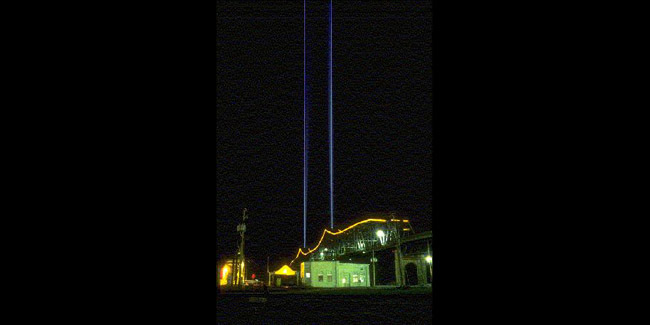 Beacons set at the peaks of the bridge cast two columns of light 10,000 feet into the night sky. The scale and verticality of the twin pillars are almost unfathomable from the ground. Accompanying the beacons are two 1400 foot courses of fiber optic cable. They create an appropriately scaled base for the columns of light while reiterating the elegant curves of the 1930's bridge. This sweeping wing or bow-like form chases the structures curvilinear profile with two lines of deep blue. The simple graceful lines of the work provide the necessary degree of subtlety to temper the sculptures considerable scale. 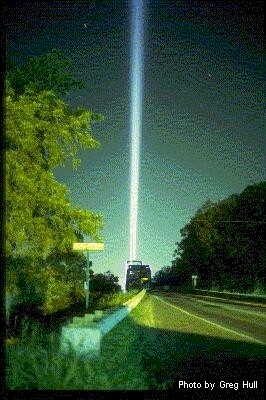 The enduring pillars of light are visible from more than 12 miles. Every night they mark the location of the city, discretely nestled between the bluffs and forests of the area and serve as a visual point of reference for pilots in the thick night sky. remains a precarious compromise with gravity. The decision to make contact with one of the almost rigid columns of light momentarily saturates the cockpit. However, by flying carefully between the pillars, the true nature of the sculpture is revealed. As you pass through Amelias Gate, time appears to slow as this aerial threshold offers a uniquely somber and reflective pilgrimage. In this respect, the memorial exists between 1000 and 10,000 feet above the earth. The interplay of aircraft, like moths to a light, ultimately lends itself to the experience of the earth-bound viewer. Fuselages and wings become another physical aspect of the work reminding us of the curious and inquisitive nature that first drew pilots to flight. Here the work honors the life and spirit of Amelia Earhart. It celebrates the connection between the city, whose history helped shape the adventurous youth, and the aviator whose inspirational impact continues to touch the imagination of the world. Amelias Gate resides in the river valley that unfolds outside the bedroom window in which this remarkable individual was born. It climbs to the sky from just below the bluffs where Amelia Earhart first watched hawks soar on the winds. During the fall of 1998, the second phase of the installation was completed. Each of the light sources for the fiber optic cable was outfitted with a motorized, four color wheel. With the change of each season, the fiber optic cable takes on a new hue. The colors of the fiber optic cable cycle through red, amber, green and the original deep blue. The city of Atchison , Kansas has a long rich history of exploration, travel and commerce all revolving around crossing the river and entering the unknown arenas that lay beyond. The Mo-Kan bridge, as it was originally named, has been a dynamic visual element of the city for 60 years. It crosses the Missouri River, connecting the States of Kansas and Missouri. This remarkable steel span was completed in 1938 and was dedicated by then-Senator Harry S. Truman. It is approximately 2600 feet in length with twin peaks that rise 140 feet above the water. This bridge which would ultimately support the sculptural memorial, was renamed the Amelia Earhart Memorial Bridge in 1997.